See how the ambitious immersive sim is shaping up. Science fiction immersive sim sequel Consortium: The Tower was already a game to watch. However, after seeing the latest video, I think it's a game to watch with both eyes wide open, and with no blinking. The latest Production Update, below, reveals the current state of the Die Hard-esque infiltration game set in a simulated skyscraper, and it appears to have come on leaps and bounds since the early trailers I remember watching a couple of years ago. In the video, iDGi CEO Gregory MacMartin shows off some new game footage, including the skydive onto, and into, the tower itself, and a genuinely hilarious encounter with an NPC. You can hear some of The Tower's voice acting talent here, which includes Male Commander Shepard himself, Mark Meer. MacMartin also explains how far development is along, in both the video and in this Fig update post. 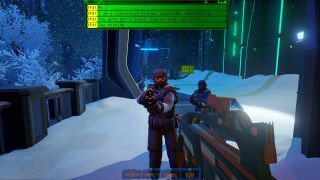 "After a year of very intense production, iDGi has officially reached a major milestone: all core planned game mechanics for Consortium: The Tower are functional and working well together. In layman's terms, this just means that we now have a fully featured videogame with a hefty chunk of working content." "Most of the Churchill Hotel, which represents *roughly* 1/2 of the complete game, has been fully realized." "With this milestone achieved, what lies ahead for us is largely content creation and polish across the board. NPC choreography in particular comes later (this is an expensive and time consuming process, and we want to ensure all story/character logic issues are worked out before finalizing with choreo), as will a complete visual overhaul of the H.U.D." There's a Twitch stream planned for June 10, which will show off more of the game, and a playable backer demo in the pipeline as well, which will allow backers to play an early version of the tower's rooftop area.